May 6, 2013: A South Australian Government advisor has blown the whistle on the dangers of building wind farms on prime agricultural land. Mike Smithson reports. One of the South Australian Government’s own advisors has blown the whistle on the dangers of building wind farms on prime agricultural land. Former MP Peter Blacker is heading the Government’s independent council into windfarm impacts and came out swinging at a Parliamentary Committee today. He said wind sheer from massive turbines sweep across vast areas, from farm to farm, and that creates a hazard during aerial bushfire fighting, and similarly when spraying herbicides and combating locust plagues. Mr Blacker claims a 199-tubrine proposal for Yorke Peninsula could affect an 800 square kilometre area, and he called for such farming properties to be zoned windfarm-free. “Probably 97 per cent of South Australia could be available to windfarms without affecting prime agricultural land,” he said. Mr Blacker also raised concerns about the contracts signed by farmers who agree to house turbines on their properties. He said secrecy clauses prevent them from speaking out if they change their mind. 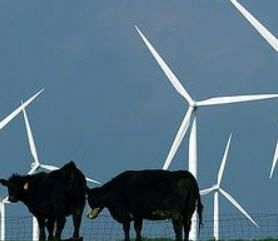 “Land values have dropped considerably where a wind farm is on it,” Mr Blacker said. The Greens support renewable energy, but strongly reject Mr Blacker’s assessment. “Your property is worth more, not less,” Greens MP Mark Parnell said. Can turbines and free range hens co-exist? July 16, 2012 – If you as a free range egg producer were suddenly told that a tall wind turbine was likely to be built adjacent to your hens, what would you do? Would you think, ‘OK I am not bothered’ or would you have sleepless nights worrying about it? Does it depend on how near the turbine would be to the hens? Supposing it was close to the hens’ house, could the hens become accustomed (habituated) to the turbine? 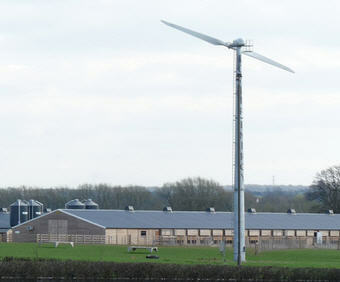 Whereas hens may be able to cope with small turbines, can they also be un-phased by the very big ones that are springing up throughout the UK? With the increased emphasis on green electricity generation, these are interesting questions to be asking. A Consultant has to look objectively at the situation, so I am presenting to you what I think may be the dangers. I might be wrong but until it is proven that hens can indeed take no notice of large wind turbines, I think that it is sensible to be cautious. So the basic question that has to be assessed is whether it is practicable for free range hens to co-exist adjacent to a wind turbine. Farm animals have proved to be resilient and unperturbed by the turbines, but that does not mean that hens are too. There is little evidence at the moment that hens can become habituated to the close proximity of wind turbines. Indeed, equipment that can be both noisy and which also throws shadows and has a flickering effect could be frightening to hens. Although hens have been domesticated, they still have an inherent fear of flying predators. There have been many documented cases of panic caused to free range hens by helicopters and hot air balloons. The hens on the range area rush in panic to the safety of their house and this can lead to stress and possibly death by smothering. Birds of prey have a dramatic effect on the behaviour of the hens. When these predators fly over hens that have ventured out of the house onto the range area and especially when they hover over the hens, there is a headlong rush by the hens for the security of having a roof over their head. This basic inherent reaction is the equivalent of their hiding in the undergrowth when they were in the jungle before they became domesticated. It is not possible to eradicate this behaviour. It is entirely perceivable that the flicker affect and especially the moving blades on a wind turbine would induce a reaction in the hens that would be the same as for birds of prey or helicopters. Hens (and all birds) have eyes that have a very wide monocular field of vision. This allows them to be able to focus on both near and far away objects at the same time. Their eyes are relatively large when compared to human eyes and they have a flattened shape. With such good vision, they are therefore able to stay alert whilst out on the range. They could very easily see the movement of the blades of the wind turbines, both on a horizontal and a vertical plane to them. In addition, the cones in the retina of the eyes are concerned with colour vision. They produce sharp images and colour sensations because each cone has its own nerve connection. For example, hens can see very much better in the ultra-violet wavelength area of the spectrum than humans. The rods in the retina of the hens’ eyes create a large light reception facility for maximising vision. It is therefore unwise to assume that something that would not be seen as a threat to humans or farm animals would not be seen as such by hens. The eyes of hens are different and they have an inbuilt fear of predators from the sky. These movements could be either near or far away and would be seen clearly by hens both at the same time. Movements that are rapid or slow can induce a fear reaction in the hens. The physiological construction of the hens’ eyes implies that there may well be a problem. Therefore it is clear that there is a possibility that the turbines could have a financially debilitating affect on the business of producing free range eggs and that those who make a decision on a proposed project should not ignore this probability, because the turbine could indeed be a stressor for the hens. • induce an increased fear reaction leading to the hens taking fright more readily, which can cause death from smothering and broken bones. So stress is probably the most common cause of a free range flock failing to attain its genetic (and therefore its financial) potential. Often, a stressed flock is one that has an increased mortality pattern, where it becomes virtually impossible to stop the escalating number of hens that die. An input from a Specialist Poultry Veterinary Surgeon is invariably necessary. They would be likely to endorse that probably the most common cause of death is from peritonitis and that this is usually associated with stressors. In my view, the possibility of stressed hens caused by the wind turbine can not be ignored. I suspect that some would argue that the hens could become accustomed (habituated) to the presence of the wind turbines. They might be right because this can be true for some potential stressors. However, for one that is so deeply inherent as the fear of predators, I feel that this needs to be proven and that those wishing to install the turbines should be made to present statistically sound evidence that shows that the welfare and productivity of free range hens is not detrimentally affected by their turbines. If they can’t do that they should erect their turbines elsewhere. Wind turbines create a noise that is higher than the background noise level at a particular site. Whether this is intrusive is less clear, because of the variability of all of the associated factors that combine to create noise. Noise tests on a turbine that is typical of ones that are currently being erected in the UK show that both the operational noise level of the turbine and the background level increase exponentially with increasing wind speed. This means that the total noise levels tend to be higher when the wind speed is stronger. Let’s consider what would happen with a turbine that is close to a free range site. I suspect that for the hens, the time when the hens would be at the greatest risk from disturbance from the noise of the turbines would be when the wind speeds are low. Information that is available online demonstrates that whereas the difference between the total noise and the background noise was only 4.8 decibels (dB Laeq) when the wind speed was 12 metres/second, it was 13.9 decibels (dB Laeq) when the wind speed was only 3 meters/second. 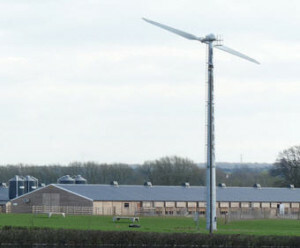 It is likely that the erection of a tall wind turbine within the lines of sight and in close proximity to free range hens could detrimentally affect a free range egg enterprise. The health and welfare of the hens and the financial viability of the business could be put at risk. The basic reason for this is that the hens could perceive the turbine as a stressor. There is ample evidence within the free range egg industry that stress is one of the most common causes of failure. Until there is evidence to show that hens can indeed co-exist in close proximity to a large wind turbine, it would, in my view, be unwise to take the risk. So there you are! Are you going to prove me wrong? September 2, 2011 – What if siting massive 50-story industrial wind turbines close to peoples’ homes harms them, kills animals and disrupts lives? All of this has happened to several families in southern Brown County, Wisconsin. One couple tried to live with the six 50-story turbines west of their property, but she [the wife] had migraine headaches after the turbines went online in December 2010. They could not adjust to the low frequency noise emitted by the giant machines. My husband and I were invited to visit their home in April after they left to stay with their daughter. We all wondered if the swallows would return in May to their mud nests in the barn. They did not. Recently, I learned of another farm family in the shadow of wind turbines who were having similar health problems. Their three children are now living with their grandparents, where their headaches have subsided. One-third of this farmer’s dairy herd have died since the turbines began operation. An autopsy of a calf showed no infectious cause for its death. What now? For the past 20 months, I and my neighbors have written letters, paid for billboards and testified at hearings appealing to our representatives and State Board of Health for a moratorium until epidemiological studies can be done in Wisconsin wind projects to find the answers needed to help these families and others like them.